Born in 1994 in a garage in Manayunk and operated under the leadership of Tom Kehoe, a pivotal figure in the Philly beer scene, Yards is dedicated to the tenets of community and sustainability. In late 2017, the iconic operation relocated to a massive 70,000-square-foot, 100,000-barrel-capacity brewery and taproom in Northern Liberties. 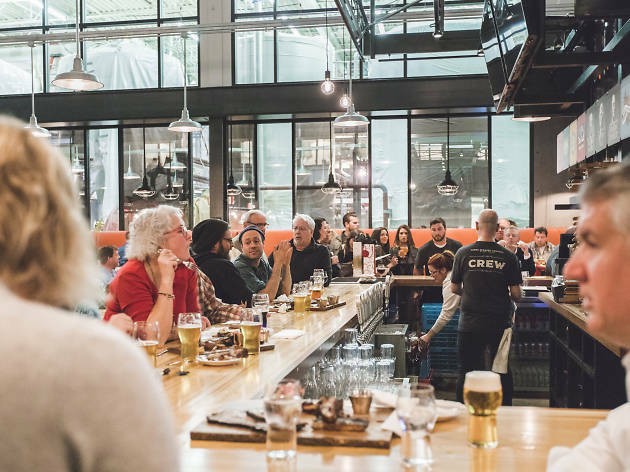 Guests can stop in for flights off of the 20-tap draught line and beer-friendly fare from chef Jim Burke. Yards’ signature beers are all over the menu, including mustard accompanying a Bavarian pretzel, Philly Pale chicken with fried potatoes and greens, and a dessert float featuring Love Stout. Any time I have the opportunity to visit another city, I make an effort to sample the locally brewed beers when possible. On my last visit to Philly, I made a stop at the Yards Brewery. I was familiar with Yards and had most likely tried it once or twice at a beer fest but hadn't had nearly scratched the surface. The tasting room featured a bar with a full variety of Yards beers on tap. I opted to order a flight of the "Ales of the Revolution". First off, the flights were very reasonably price, and as always a great way to sample a few different tastes. The beers featured were Thomas Jefferson Tavern Ale, Benjamin Franklin Tavern Spruce, George Washington Tavern Porter, and Washington's Reserve Porter. They were all on the heavier side, but none disappointed - particularly the Tavern Spruce, which had the appropriate hints of a fresh cut Christmas tree! 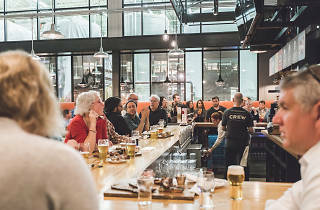 The tap room doesn't directly sell food, but the brewery has a relationship with one of the area's food trucks which parks just a few steps outside. If you're in Philly, a stop at Yards is a must!